A little boy was asked what part he had in the Christmas play. He shrugged his shoulders and said that he didn’t really have much to do. He had hoped to be a king and wear a crown and a colorful cloak, or at least be a shepherd with a crook and perhaps a stuffed lamb under his arm. But, he was a small and quiet boy, so he was Joseph. He said, “I don’t have much to do. I don’t even have anything to say. And”, he said with a good deal of emphasis, “I have to sit next to a girl”! We hear of Joseph’s part in the birth of Jesus in Matthew’s gospel. Again and again Joseph is told by heavenly messengers what he is to do. When he is wondering what to do with a pregnant fiancée who seems to have been unfaithful to him, the angel tells him in a dream to marry her. When the life of the baby Jesus is in danger, the angel tells him to escape to Egypt. When Herod is dead and the danger is passed, the angel tells him to take the baby and his mother back to Israel, and to settle in Nazareth. Joseph the carpenter was an ordinary man. His life was regular and routine. He wasn’t looking for adventure. He wasn’t looking for fame. What he was looking for was a quiet life with Mary and the children they would have together. Suddenly he is thrown into a set of events that he would not have imagined in a million years. A few months before, Joseph had been content with the simple life. What an adventure God had taken him on! And you know what – in all these events that turned his life upside down, not one single word from Joseph’s lips is recorded in any of the gospels. All the other characters in the Christmas story speak. I’m sure he must have had some thoughts about the events that were taking place. Maybe Joseph was just one of those people who never have much to say – you know…the quiet types, the ones who are always thinking. There were no words coming from his mouth, but you can bet there was plenty of activity in his head! One thing’s for sure: Joseph might have been a man of few words but it is clear that Joseph was prepared to allow God to turn his life upside down for the sake of the baby that Mary was carrying. I know if I were in Joseph’s place, I would have had some questions. Why is God causing so many problems for us? Couldn’t God have waited until the wedding ceremony had been completed before Mary became pregnant? Or, perhaps God could have formed Jesus from the dust of the earth, like in God’s creation of the first human being, and just skipped this whole pregnancy and birth thing? Why does God’s have to do it the hard way – hard on Mary and Joseph, hard on Jesus when he is treated as a criminal and hard on us as we try to understand God’s way of doing things? In his book “The Jesus I Never Knew”, Philip Yancey shares an episode from his youth when the concept of “the Word becoming flesh” dawned on him with profound meaning. Here’s what he says: “I learned about incarnation when I kept a salt-water aquarium. Management of a marine aquarium, I discovered, is no easy task. I had to run a portable chemical laboratory to monitor the nitrate levels and the ammonia content. I pumped in vitamins and antibiotics and sulpha drugs and enough enzymes to make a rock grow. I filtered the water through glass fibers and charcoal, and exposed it to ultraviolet light. “You would think, in view of all the energy expended on their behalf, that my fish would at least be grateful. Not so. Every time my shadow loomed above the tank they dove for cover into the nearest shell. They showed me one emotion only: fear. Although I opened the lid and dropped in food on a regular schedule, three times a day, they responded to each visit as a sure sign of my designs to torture them. I could not convince them of my true concern. To my fish I was God. I was too large for them, my actions too incomprehensible. My acts of mercy they saw as cruelty; my attempts at healing they viewed as destruction. That’s what happened in the events of Christmas. Even though God is different from us in so many ways, nevertheless, he chose to enter our world in the best way possible so that “fish” like you and me could see what great love God has for us and experience how God wants to save and help us. Jesus could have come as a prince appearing on the scene in a flash and a cloud of smoke. God had done that in the past on Mt Sinai, but his people feared him and didn’t appreciate his love for them and what he wanted to do for them. So, God took on our human flesh, was born of a human mother, and became one of us, so that we could understand his love for us. •	He becomes an embryo in the womb of a mother. •	He asks two people to be part of an exceptional event, and even though it will dramatically change their direction in life, he places into their hands the life of his Son. •	He risks during the nine months of gossip and innuendo that the couple would stay true to their commitment to be the parents of the “Son of God”. •	He risks the unsanitary conditions of a stable and watches like any father as his Son emerge from the womb to face the harshness of this world. •	He trusts these two people to ensure the safety of the little child when Herod’s jealousy leads to insanity. He became one of us so that he could talk to us, show us what he is really like, and to demonstrate to us that God loves us and will do absolutely anything to break down the barrier of sin between him and us. 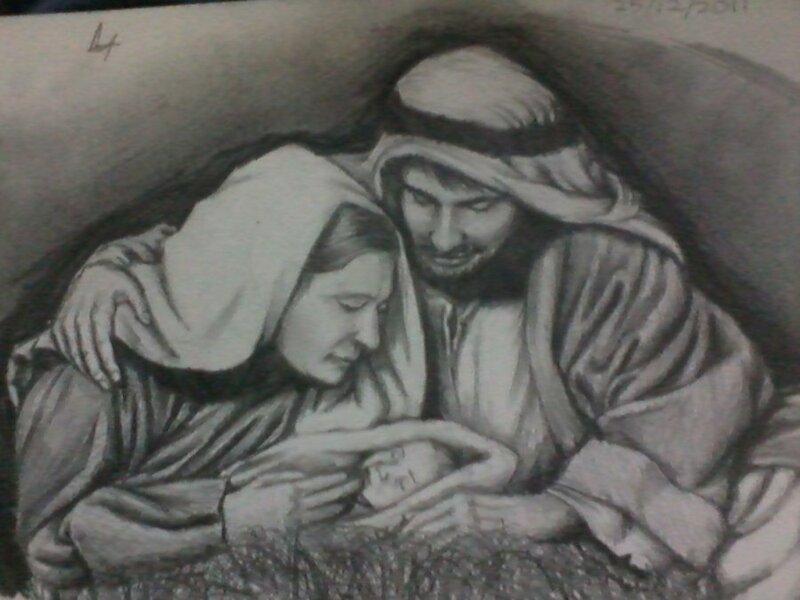 He turned the lives of Mary and Joseph upside down for us and they willingly did what they had to. They believed that God knew what he was doing; they trusted God even though the birth of this baby was going to mess up their own personal plans for life. We can learn from him to lean on God, to pray for God’s strength and courage to face the hardships and struggles of life. God may not take away our difficulties, but God can give usx his help and strength to bring us through it. This is what Joseph found. We can learn that in the end God is in control, even though it seems earthly powers have the upper hand. Another thing we can learn from Joseph is his willingness to let God turn his life upside down. Joseph understood that God was doing something wonderful not only for him and Mary but for the whole world. Would you be willing to let God change the plans you have, to take your life in a different direction than you had envisioned? Joseph was willing. He came to see that even though his life was going down a path that he didn’t plan, God had a much bigger plan that needed to be followed. Joseph knew God as well as any person of his time. But with that first Christmas he came to see God in a whole new way. This baby he was given to care for and protect is God come to earth, Emmanuel, God with us. This baby has come to save people from their sin. He is God here on earth with us. This is our savior, God, and king.